The latest revolution in vaping technology rests with temperature sensing and limiting devices, coupled with Nickel (Ni-200) wire. Ni-200 is a nickel metal alloy that is known for its excellent electrical, thermal, and magneto-strictive properties. Due to these unique characteristics, Ni-200 wire can be temperature controlled with the proper device. The ability to control the temperature of your coils substantially adds to the overall quality of your vapor. Now you can build your own coils using Ni-200 wire, providing for a customizable vape like nothing you have experienced before. 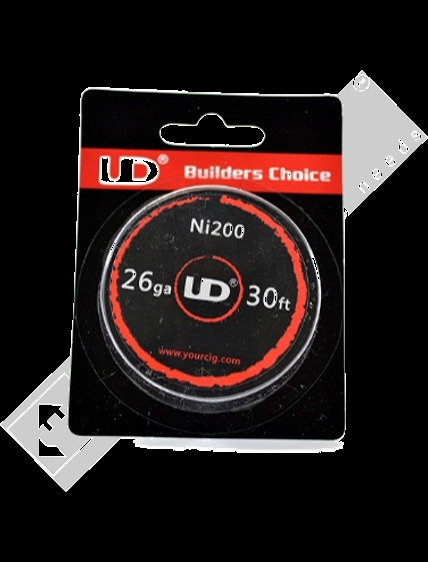 As with all of Youde’s products, the UD Nickel Ni-200 wires are made with the highest-quality Nickel alloy. If you want to be on the cutting edge of vaping technology, you absolutely must try Ni-200 wires with your temperature limiting vaporizer. MANUFACTURER’S WARNING: Risk of Battery EXPLOSION! Nickel wires are specifically designed to be used with advanced devices furnished with circuit boards capable of controlling coil temperature, such as the Vapor Shark DNA 40. It is very important that you DO NOT USE this wire with any other device whatsoever, as it can result in battery explosion and injury!! DO NOT USE Nickel Wire with Devices, Such as: Mechanical MODs, iStick, iTaste MVP 3.0, iTaste SVD, Xbox, SMOKtech M80 Plus, etc. You can ONLY use Nickel wires with devices with temperature SENSING AND LIMITING capabilities, such as the Vapor Shark rDNA 40. This item is not covered under warranty.